Airports today are busier than ever with millions of travelers running through them to catch flights. 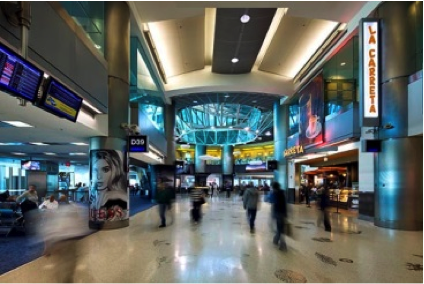 For many travelers the time in the airports is not for leisure travel but rather part of a high pressure game to pack as much business as they can into too few hours of an already over scheduled day. Grabbing something to eat, drink or read on their soon to depart plane, simply cannot be done by taking a leisurely stroll through an airport shop. What’s needed is to make these products more accessible where travelers may shop quickly and still catch their flight. Enter the motorized mobile kiosk and concession stand. 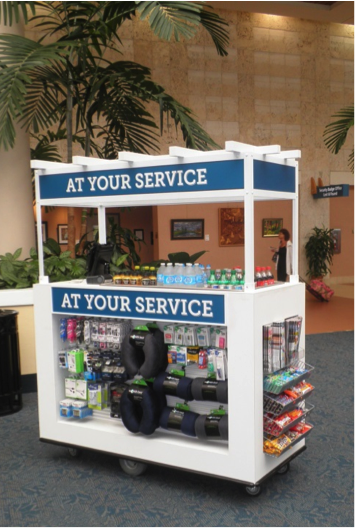 This stand is a portable “mini” store that can be located anywhere travelers need fast service. Unlike the brick and mortar stores that have fixed locations within the airports, these mobile stands can be moved easily to follow the demand of airport travelers throughout the day. Great solution! Now the catch. When loaded with products, these carts become heavy and difficult to maneuver through the airport. Inclines, even relatively small ones, become major obstacles to overcome. Solution, motorize the cart! 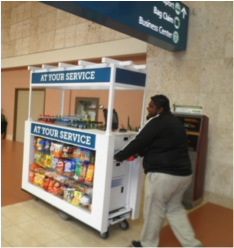 Working with the engineers at Electro Kinetic Technologies, the cart designer came up with a motorized solution that would allow the kiosks to be moved quickly and effortlessly throughout the airport environment even on inclines. The final cart design provided all of the necessary product display space including storage for the operator to safely stow their belongings and enough on board battery capacity to keep the cart mobile throughout the day. To allow customers to choose and purchase their items quickly, a point-of-sale terminal was added to the cart, allowing customers to choose and pay for items quickly. The terminal needed to be plugged into a wall outlet for operation which limited where the cart could be located within the airport. How can you have a truly mobile kiosk while still being tethered to a wall outlet? Solution, make it run off batteries! Although there are battery powered point-of-sale terminals, the customer wanted a full service terminal and in fact, had already selected the model which could only be powered by the 120 VAC wall outlets found in our homes, businesses and of course, airports. The problem was that the motorized cart only has 24 VDC power available. What to do? Again the engineers at Electro Kinetic Technologies came up with a solution. Let’s convert the on board battery DC voltage to AC to allow the point-of-sale terminal to be powered directly from the on board batteries. With this solution, the operator can move the cart and transact business anywhere within the airport, without concern for AC wall outlet locations or availability, making the kiosk truly mobile. When recharging of the batteries is needed, the charger provides enough power to both recharge the batteries and power the point-of-sale terminal so the kiosk can remain in service. A motorized kiosk with on board rechargeable battery power provides customers with products anywhere, anytime they are needed. Now that is a solution that is “at your service”.